While many are accusing Carrier IQ of all kinds of mischief, including logging the text messages, call information, and browsing history of unsuspecting subscribers, others claim that the controversial software is much more harmless than it is being portrayed. Dan Rosenberg, who is a security expert at VSR, shares in his blog that Carrier IQ is actually unable to read the contents of text messages, e-mails, and other types of sensitive data. In other words, the carrier cannot use the software to eavesdrop on you even if it wanted to. That is the conclusion Rosenberg arrived at after extensively analyzing the software's inner workings on a Samsung Epic 4G Touch. He does point out, however, that Carrier IQ is capable of sending tracking information on some occasions, such as a device's GPS coordinates. The report has also found that keystrokes can indeed be logged, but that cannot be done outside of the dialer application. And since the carrier knows who you are calling anyway, that cannot be viewed as a potential threat to a user's privacy. What may seem somewhat disturbing is that website URLs are being sent as well, including secured ones, but on the bright side, the actual web page content cannot be viewed by using Carrier IQ. The list of applications that are running on a smartphone is also accessible by the carrier, but that is likely used for detecting unauthorized tethering rather for anything more elaborate. So, what do you guys think? Is Carrier IQ really that much of a privacy threat, or is it just a victim of exaggerated claims? Feel free to drop a comment below and let us know. Perhaps it is exaggerated or perhaps it isn't. I'm personally still uncertain. However, I would not consider the ideal intended application of this information collecting to justify such power (if it is as serious as it seems). Employees who work for the CIA (or Cyber IQ) are people too. People who are there for our security are not immune to this kind of consideration (security leaking pictures of peoplehttp://j.mp/vnDl75). While videos on the internet show the ugly side of people, they also show you the ugly side of people in various outfits (e.g. police uniform). Lastly, I hope that legitimate investigative journalism continues in whatever form it needs to so we don't forget this fundamental truth. What I find funny is that the majority of the top comments are from people who do not value their own privacy probably due to the Desensitization the Media & Gov. has been pushing real hard for the past decade, with the false threats of terrorism etc. . I for one am not willing to sacrifice my freedom/privacy for false threats of terrorism, So for that reason I am greatful that my carrier (Verizon Wirless) doesn't use this product. It's still rotten because a) no one was notified it was on their phones, and b) there is no option to opt out of any part of it. 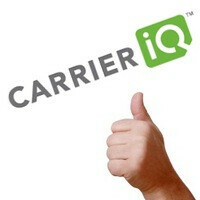 Who commissioned the pro-Carrier IQ study?? ?